While Seven continues to receive good regional radio play, recording has begun for Rose's second album, which is expected will be out mid-2019 More news to follow. Skilfully straddling the EP:LP divide, Seven is out now! Expect a mix of genres on this little album - from traditional to contemporary, passing through slow jazz along the way, and including a whiff of country gospel for good measure. 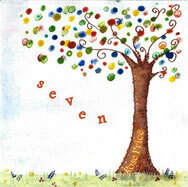 Seven also features Rose's cover of the incisive Lester Simpson song Standing in Line, which you can also download as a single from iTunes, Amazon, CDBaby and Google play, and many other popular music download sites. For more details about the album (e.g. track listing, background, musicians, etc. ), please see the Seven page.